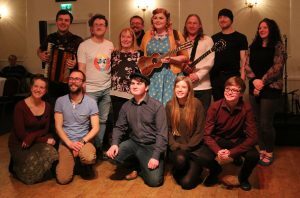 Manx group Biskee Brisht recently won the local competition to choose a song to go forward for the annual Pan-Celtic Song Contest, which will take place in Ireland later this year. 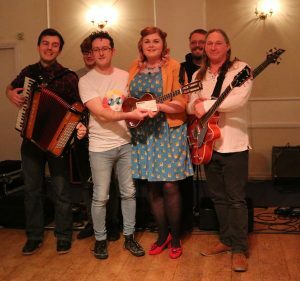 This is the second time in succession that Biskee Brisht has won the local heat of Arrane son Mannin (Song for Mann), which was held at the Masonic Hall in Peel and interspersed with a rich selection of musical entertainment. 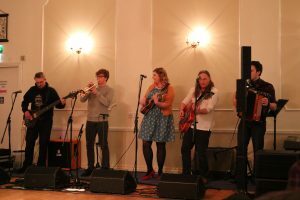 There were a total of three groups seeking victory this year in a competition which looks for a new, original song both written and sung in the Manx language, which will compete alongside songs submitted by our Celtic neighbours. Local representative of the Pan Celtic International Council, Fiona McArdle, also took on the role of compère for the evening and announced that Clare Kilgallon, also from the Isle of Man, will this year take on the role of President of the Pan Celtic International Festival. Prize money and support for the local event was provided by Culture Vannin.